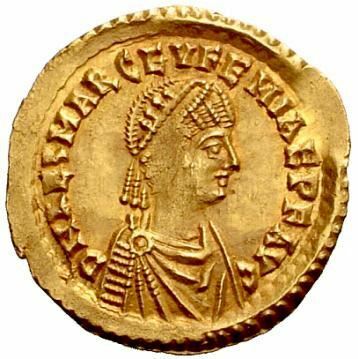 Aelia Marcia Euphemia was the wife of Anthemius, Western Roman Emperor. She was the only known daughter of Marcian, Emperor in the East. Euphemia was featured as an Augusta in Roman currency from c. 467 to 472. However her role as an Empress is only confirmed by these Archaeological evidence as the literary accounts cease mentioning her by the point Anthemius moved to Italia. Coins of her are impossibly rare, and probably only exist in museums or in the collections of the super-wealthy.